We are a London-based company which offers some of the most professional and inexpensive office cleaning services. Our staff have undergone comprehensive trainings and know how to do the necessary work. They apply the most effective approaches in cleaning which guarantee speedy and well done cleaning. Use our office cleaning which we provide in London as a one-off and regular service. We guarantee you that you will be pleased with the results of our staff’s work. You can get in touch with us by phone, e-mail and online. Use our office cleaning services which will ensure the healthy atmosphere in your workplace. Our employees use the most effective vacuum cleaners, suitable mopping tools and other supplies to sanitise the floors. They will wipe the dust from the desks, cabinets, shelves and other hard wooden surfaces. Our cleaning workers use harmless for the environment and health detergents. They work fast and hassle-free. We guarantee you that our staff won’t obstruct your working process in any way. Use our professional office cleaning services which are at your disposal in London whenever you need them. You can order them to be done weekly, daily, twice a week or as often as you require. The cleaning will be done at a day and time which is most convenient to the customer. Schedule the office cleaning which you need using our booking form, free online chat or call centre. You will receive excellent cleaning service at a low and reasonable price. If you want your employees to work in a hygienic and healthy working place, use our professional services. 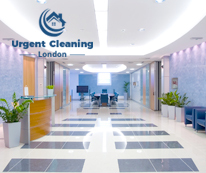 The office cleaning which we provide in London is reliable and done by qualified cleaners. They are at your disposal during all weekdays, weekends and bank holidays. Our office cleaning services will improve the quality of the indoor air in your working place.